Eric David Laxman is a multi-media artist who created a unique studio and showroom at the Garnerville art and Industrial Center near Haverstraw, NY and now works from his home studio in Valley Cottage, NY. He is very active in the Rockland artist community serving as a teacher, curator and gallerist. He has exhibited his diverse works throughout the metropolitan area and nationwide. 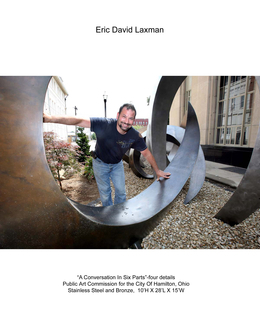 Laxman was awarded the County Executive Art Award for Visual Artist in 2007 and has been recognized by numerous local organizations for his community service. 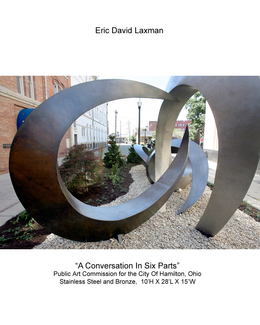 Laxman has completed numerous public sculpture commissions including City of Sculpture in Hamilton, Ohio; Greenwich Hospital in Connecticut and the Summit Medical Group in New Jersey. Laxman has also completed numerous sculpture memorials including: a memorial to Corporal Manny Lopez who was killed in action in Iraq, in Haverstraw and the JCC Munich 11 Memorial honoring the slain Olympic Athletes in West Nyack. At Rockland Community College’s new 9-11 Memorial Garden, Laxman artfully combined parts of salvaged steel I-beams from the World Trade center Site with other steel and marble elements in “Spirit Rising”. His custom furniture and sculptures have been featured in the The New York Times, The Journal News Home Design Magazine, The Artful Home, Hudson Valley Magazine, The Hook, Metrohouse Magazine, Rockland Magazine, Rivertown and others.